Cigar Rolling and more unique features for your special events in Houston, TX. A cigar roller is a perfect addition whether you are planning a wedding, corporate event or even a birthday or anniversary party. We are the only premium brand that uses a full time events department that will create a custom entertainment feature that will compliment your entire event. Cigar Rollers together with custom cigar bands with premium Dominican Cigars all come together to create a great evening for the aficionado and the novice. 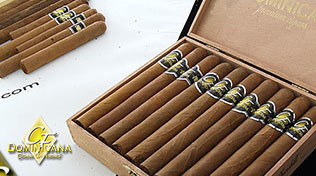 Your cigar rolling planner will coordinate the perfect custom cigar package for your event. This will include our brand of imported, Dominican quality cigars, one of our highly trained cigar rollers, a beautiful cigar server and custom cigar bands created specifically for you. Houston rollers are typically booked for 2 hours with more hours possible. All of the Cigar Rollers speak English, look great, are friendly, outgoing and can interact well with your guests to make the cigar demonstration one of the highlights of your special event. Your guests can even ask questions about the unique features of cigar rolling that they are seeing right before their eyes. 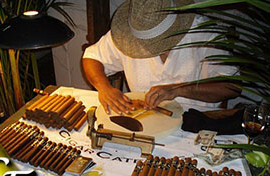 Pro event planners will create a cigar rolling feature that will make your Houston event the talk of the town. They will help you decide on the correct quantity of cigars, type of cigar and the proper amount of time needed depending on the make-up of your guest list. Simply submit the details of your event and include one of the Houston locations closest to you. We will go ahead and create a custom cigar package quote that includes cigars, your own personal cigar roller and beautiful custom bands.